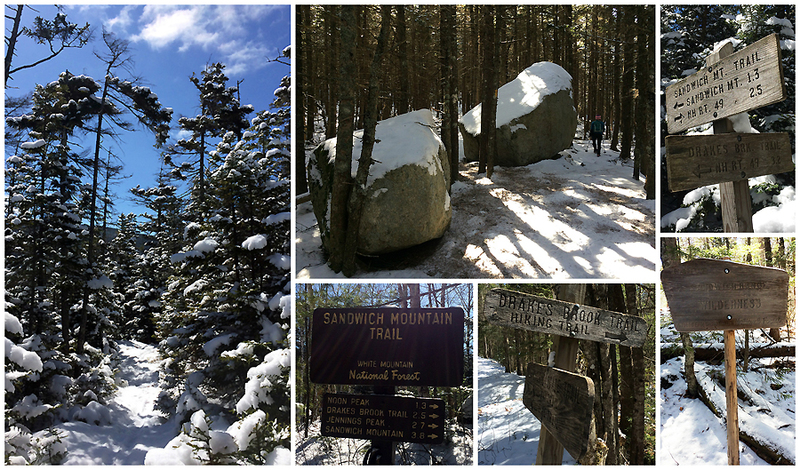 - On Tuesday the plan was to hike Sandwich Dome via Sandwich Mountain and Drakes Brook trails. 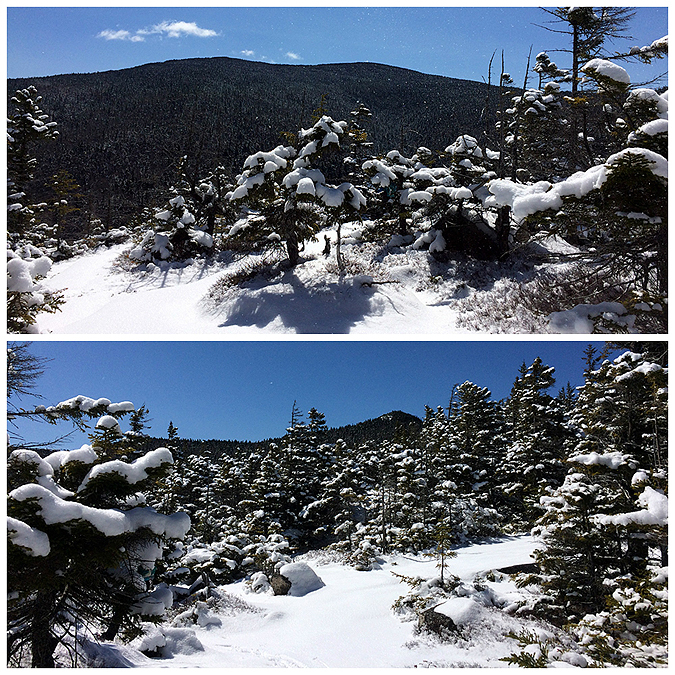 The sun was out and a fresh couple of fluffy inches had fallen making the trail and surrounding mountain ranges look beautiful. 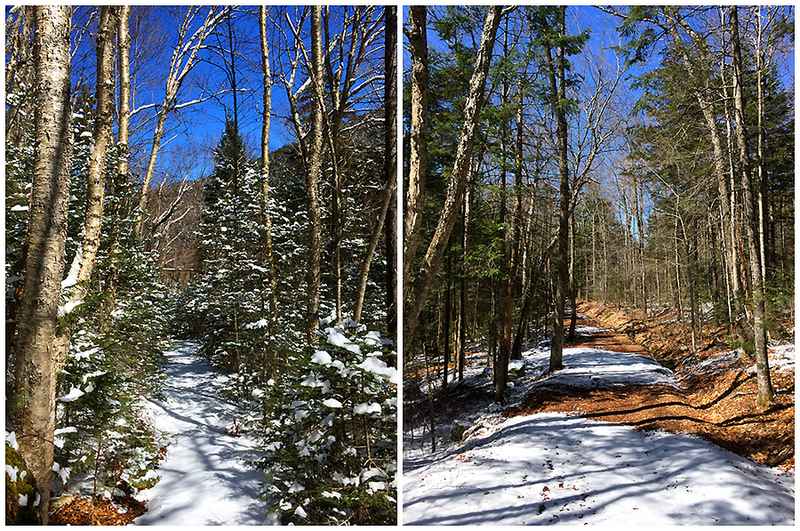 However, this is where the beauty ended as the fluffy snow was hiding a significant amount of ice above 2,500 feet. As we approached the junction of the upper end of the Drakes Brook Trail below Jennings Peak we made the decision to head down the Drakes Brook Trail instead of continuing on. The conditions made for slow going and constant slipping even in our traction, and even though it was a great weather day we both were not able to enjoy the bluebird skies because of the hidden ice flow. We carefully made our way down Drakes Brook Trail by hugging tress and going off trail when needed, in spots it was a relentless battle to stay upright but we made it out with no injuries. Needless to say all our years of hiking in every kind of icy condition came in handy today! - Thank goodness for search and rescue, they are volunteers who go out in the middle of the night and save every kind of hiker, from unprepared and inexperienced to those who have logged thousands of miles. Obviously, I didn't take too many pictures today! Wow, I can't believe an adult would take teens on a hike with so little preparation. Glad SAR got there in time!